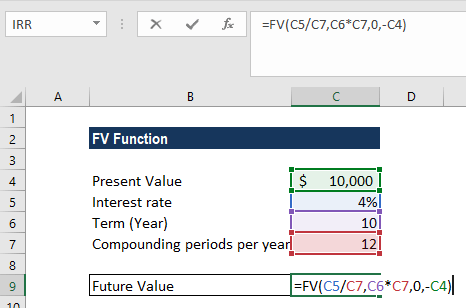 What Is the Excel FV Function? 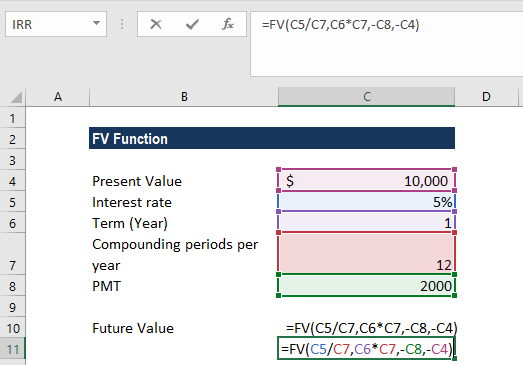 The FV Function Excel formula is categorized under Financial functionsFunctionsList of the most important Excel functions for financial analysts. This cheat sheet covers 100s of functions that are critical to know as an Excel analyst. 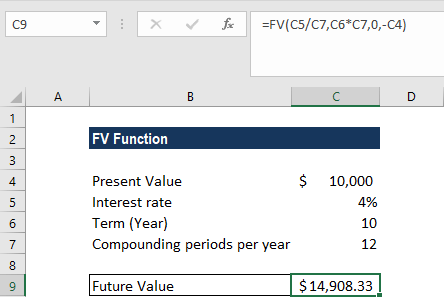 The function helps calculate the future value of an investment. As a financial analystFinancial Analyst Job DescriptionSee a real Financial Analyst Job Description including all the skills, experience, and education required to be the successful candidate for the job. Perform financial forecasting, reporting, and operational metrics tracking, analyze financial data, create financial models, the FV function helps calculate the future value of investments made by a business assuming periodic, constant payments with a constant interest rate. It is useful in evaluating low-risk investments such as certificates of deposit or fixed rate annuities with low interest rates. Rate (required argument) – It is the interest rate for each period. Nper (required argument) – It is the total number of payment periods in an annuity. Pmt (optional argument) – It specifies the payment per period. If we omit this argument, we need to provide the PV argument. Type (optional argument) – It defines if payment is made at start or end of the year. The argument can either ne 0 (payment is made at the end of the period) or 1 (the payment is made at the start of the period). Make sure use the units of rate and nper are consistent. If we make monthly payments on a five-year loan at an annual interest of 10%, we need to use 10%/12 for rate and 5*12 for nper. If we make annual payments on the same loan, then we would use 10% for rate and 5 for nper. 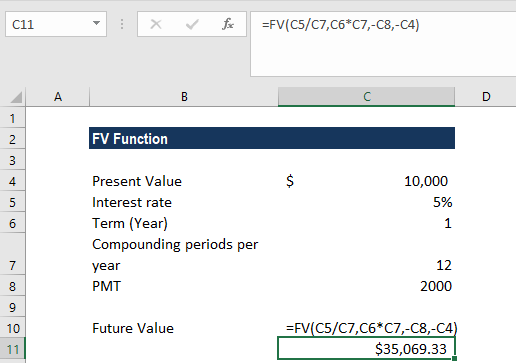 How to use the FV Function in Excel? As the compounding periods are monthly (=12), we divided the interest rate with 12. Also, for the total number of payment periods, we divided by compounding periods per year. As the monthly payments are paid out, they are entered into the function as negative values. If we forget to put the percent sign in cell C5, the calculation will wrong. 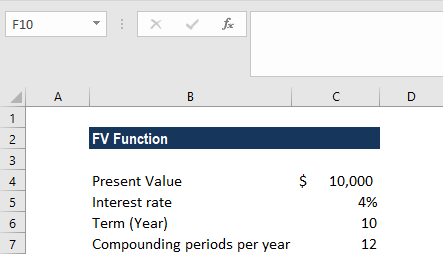 We need to enter the interest rate in percentage form or in decimal form = 0.04. The example below shows how to use the function for personal finances. Assume we need to buy a car and are saving for it. The target is to buy in 1 year. There are $10,000 in our bank account as savings. The bank pays 5% interest on our savings account. Our capacity is to add $2,000 for next 12 months into the account. Let’s calculate the amount we would need at the end of the year to purchase the car? The monthly contribution we can do is $2,000. As it represents outflow, we took it as -2,000 (-C8). If the pmt argument is for cash going out of business, the payment value will be negative and for cash received, it must be positive.